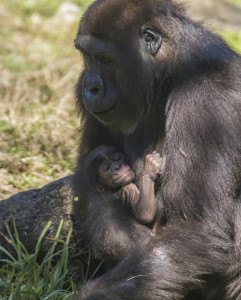 A male endangered western lowland gorilla was born at Busch Gardens Tampa on Tuesday, Dec. 16 at 11:35 a.m. The baby is healthy and is currently being cared for by first-time mother Pele, with the Busch Gardens animal care team watching closely. This is the second successful gorilla birth at Busch Gardens and brings to six the number of gorillas in the park’s Myombe Reserve habitat, a 3-acre rainforest environment that opened in 1992. Bolingo, the suspected sire, was the park’s first gorilla birth in 2005. The mother, Pele, came to Busch Gardens in February 2010 from the Gladys Porter Zoo in Brownsville, Texas. The baby gorilla, along with the rest of the gorilla troupe, can be seen on the Myombe Reserve habitat. This birth is part of the park’s partnership in the Association of Zoos and Aquariums’ (AZA) Species Survival Plan (SSP). The mission of the SSP is to cooperatively manage specific, and typically threatened or endangered, species populations within AZA-accredited facilities. Western lowland gorillas are an endangered species. Since 2004, Busch Gardens has supported the study of western lowland gorillas being conducted in the remote region of the Nouabale-Ndoki National Park in Africa’s northern Congo through the SeaWorld & Busch Gardens Conservation Fund. Coordinated by the Wildlife Conservation Society, the study’s focus on the rarely seen ecology and social behavior of the lowland gorilla is resulting in ground-breaking data on this fascinating and endangered species.